Has Telltale ever put out an episodic game series with a schedule as compressed as that of Minecraft: Story Mode? I certainly can't think of one. The first episode came out on October 13 and the studio announced today that the fourth and concluding-but-not-final episode will launch on December 22. The trailer tells the tale: The Reaper-like Wither Storm is running riot, and there's nobody and nothing to stand in its way. Or is there? Of course there is, otherwise it wouldn't be much of a game. But halting the horror will mean a trip into the dangerous Farlands, on a quest to find the one thing that can destroy the monster once and for all. The interesting thing here is that this the fourth chapter is the "Wither Storm Finale," signalling the end of the story, yet Minecraft: Story Mode has been billed since the beginning as a five-part series. And so it remains, albeit somewhat confusingly: As the announcement puts it, this episode "will turn the page on one chapter before adventures begin anew in the mysterious Episode Five launching in early 2016." So the Wither Storm tale is over (or will be at the conclusion of Episode Four), but the game will continue in Episode Five, which will apparently kick off something new. Or maybe I'm reading it wrong. 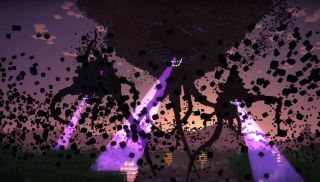 Either way, Minecraft: Story Mode Episode Four will be out next week, and Episode Five, if the pattern holds, will be out in mid-January of next year.